One product for all of your pond fish, including catfish, bluegill, bass, minnows, and carp! Produces Trophy Bass. o High enough protein to be fed to fingerlings. o Three particle sizes attract both large and small fish species. o High palatability for quick, consistent feed consumption. o Makes is easy to determine the amount of Chow® Product necessary for ponds... ...Wasted product is no longer a problem. o Feeds multi species o Fish develop more consistent growth patterns. o Provides Vitamin C which prevents deficiencies... ....Balanced nutrition that provides natural resistance to disease. o Fish grow significantly faster than if they were living solely on natural food. o Improves growth and reproduction of forage fish such as small catfish, bluegill and minnows. Bass prey aggressively on bluegill, minnow and small catfish. Game Fish Chow® Product is a complete and balanced diet that is ideal for feeding to bluegill, catfish, minnows, bass, carp, and other fish that normally populate ponds. 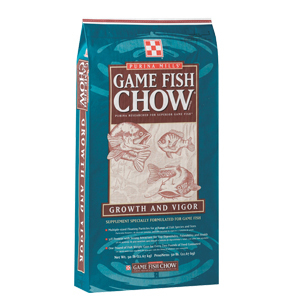 For best results, feed as much Game Fish Chow® Product as the fish will consume in 15 to 20 minutes. If feed is completely consumed within 15 minutes, gradually offer the fish additional feed. If feed is still floating on the surface after 20 minutes, the quantity of feed offered should be decreased. If you overfeed you will reduce water quality. Feed at the same time each day so fish will expect to be fed. Twice a day feedings are best during high fish activity.